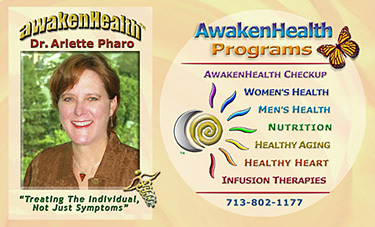 Dr. Pharo's training in both Conventional Medicine and Alternative Medicine provides patients many diverse avenues for healing and longterm wellness through unique "AwakenHealth Programs". "Health is Our Greatest Asset Throughout Life. 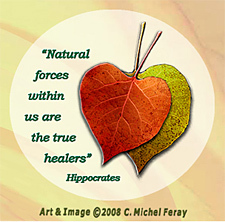 "Healing is more than treating symptoms. 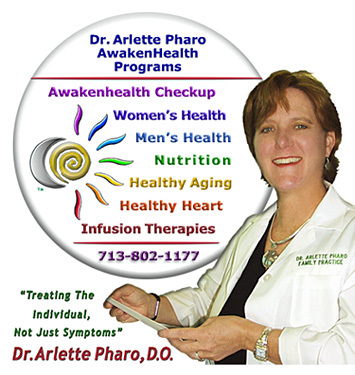 Dr. Arlette Pharo's "AwakenHealth Programs"
restore, maintain or enhance the function of your health. underlying causes of disease rather than just treating symptoms. in their "AwakenHealth Program". It doesn�t have to be much. It just has to be something. office visit is an hour session one-on-one with Dr. Pharo. This visit includes a history and physical, review of current medications and nutritional supplements, assessment of current dietary and exercise programs, and an understanding of your goals and commitment to your health needs. All of the AwakenHealth Programs listed below include the AwakenHealth Checkup. 2. Women’s Health: Dr. Pharo addresses prevention and treatment of many of the problems women experience by working with you on a lifestyle, nutrition, hormone replacement and an exercise program matched to your individual needs. Whether you come to Dr. Pharo with a problem for which you want help or are not having any current problems, you can begin with a well woman exam. The well woman exam is a thorough analysis of your current state of health with the recommended treatments and/or treatment options. These treatments/treatment options may include: bio-identical hormone replacement therapy, weight loss, thyroid disease, pap smears, breast exams, digital infrared imaging of the breasts (thermograghy), PMS, etc. ♥ Refer to #5 Healthy Heart below for more information about Heart Disease concerns for women. 3. Men’s Health: The two top concerns for men’s health are prostate cancer and heart disease. In additon, there is a lot more information about men’s hormone replacement therapy. Prostate cancer is one of the greatest concerns for men. 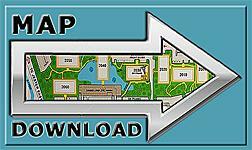 The most important exam men need to have is a digital prostate exam by a Urologist. They can also get blood work for a PSA, (prostate specific antigen). The current research shows that low testosterone levels increases the risk of prostate cancer. Therefore, having your testosterone levels checked is very important to assess your risk for prostate cancer. Testosterone levels should be checked even if you are 30 years old. This establishes a baseline. Dr. Pharo does this as apart of your AwakenHealth Program. A low testosterone level is called hypogonadism. Andropause, change of life for males, is usually associated with older men, (say around 45-50 years old), and it is often associated with a low testosterone, hypogonadism. It is important to measure baseline testosterone levels in younger men and older men. Nutritional support is important and testosterone replacement if needed. ♥ Refer to #5 Healthy Heart below for more information about Heart Disease concerns for men. 4. Nutrition: Nutrition is truly the basis for all of the AwakenHealth Programs. The underlying purpose for all programs is to establish the underlying cause of a functional problem. Nutrition helps restore function. This may seem like a foreign concept but it is true. All of us have a genetic makeup. That is called our genotype. It is not possible to change our genetic makeup but it is possible through nutrition to change the expression of that genetic makeup called phenotype. Nutrition is such an important key to who we are and who we become. There are many laboratory tests to measure our genetic makeup, our nutritional status, our digestive abilities, our detoxification pathways, our adrenal function, our hormonal status, etc. 5. Healthy Heart: Healthy heart is really an important part of every "AwakenHealth Program". Specific healthy heart programs and treatment protocols are designed on an individual basis and include nutritional support for a healthy heart, nutritional support for high cholesterol, Chelation Therapy, PTC Therapy and more. ♥ Heart Disease is a big concern for men especially if there is a family history. It is important to do a complete cardiac profile to measure the cardiac risk if there is a family history of heart disease. A Cardiac Profile not only includes cholesterol, HDL, LDL, but it includes c-reactive protein, homocystene, lipoprotein a, fibrinogin, etc. It is important to understand that if you have elevated LDL what kind of LDL you have and are you at risk. ♥ Heart disease also applies to women. ♥ The risk parameters are different from men. 6. Healthy Aging: Healthy aging is where it all comes together. Most people do not think of "healthy aging" as a lifestyle or health concern issue through every stage of their life. Healthy aging is really about making the right choices for your health and wellness throughout many areas of your life! The question that actually brings everything into focus is "when does healthy aging begin"? Obviously, "aging" begins when we are born. However, "healthy aging" can begin at any age. As we age our body needs more support. Each of us is different. All of us age. However, how aging influences each individual's health can be dramatically influenced by the choices made throughout life. "Healthy aging" is an important part of each individual's "Awakened Health". For example, exercise and nutrition play a very important role in our healthy aging. *Refer to Nutrition, Healthy Heart, Men and Women's Health above for more information. 7. Infusion Therapies: Detailed infusion therapy info is available through an appointment with Dr. Pharo. Specific healthy infusion therapies are designed on an individual basis and include Chelation Therapy, Vitamin Therapy, Alpha-Lipoic Acid and more. Infusion Therapies can be designed as healing treatments, immune system building therapies, support during detox, nourishment after surgery or dental work and much, much more. as well as nourishment and treatment of the body." 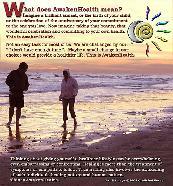 �CLICK� on Photo Thumbnail Above to open enlarged art-image-quote: "What is AwakenHealth"
Call 713-802-1177 for your "AwakenHealth Appointment"
Traditional Medicine and Holistic Medicine. Click for Dr. Pharo's Office info. "CLICK" on "Butterfly" in Art Above for Appointment Info, Address, Active "Map Quest" Driving Directions and Ways To Contact Dr. Pharo.